Brand Ambassadors Required throughout the Republic of Ireland!! ATTENTION! We're Recruiting Promotional Staff throughout the Republic of Ireland!! ATTENTION! We're Recruiting Promotional Staff throughout Northern Ireland!! Are you interested in any of the Jobs displayed on our website? To apply for any of the Jobs listed on our website you need to firstly Register With Astute Staffing. 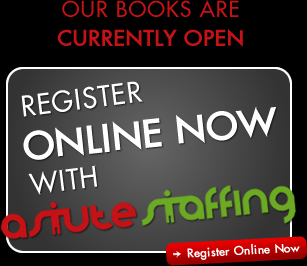 Once registered and accepted you can apply for any Job through the Astute Staffing website. Please complete our online registration form providing all your stats and experience, highlighting any special skills that may be relevant to our industry. Please ensure you attach good quality photographs - Headshot and full body length as a minimum. Please also include photographs of any activities you may have worked on previously (remember these photographs will be sent to prospective clients, so sell yourself in the best possible light). Please make sure all photographs are in colour (if necessary we can change them to black and white ourselves). We only accept the very best promotional models and talent onto our books. You should have a hard working, enthusiastic approach and the ability to stand out in a crowd. All our brands and clients require communicating in the best possible light so youll need to be confident and outgoing too.